Less than 15 years after the Wright brothers' historic flights of December 1903, NOAA's National Weather Service issued the first official aviation forecast -- to help deliver the mail. 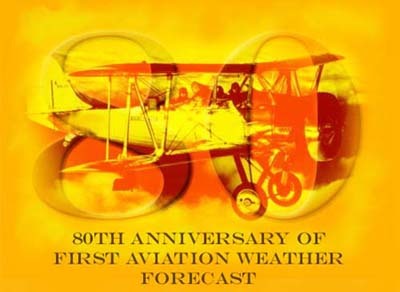 Now 80 years later, the agency issues thousands of aviation forecasts, advisories and warnings to make flying safe and efficient. On Dec. 1, 1918, NWS forecasters combined ground observations with data collected by instrumented kites and tethered balloons and provided a forecast for the Aerial Mail Service route from New York to Chicago. The reporting network for that historic forecast consisted of 18 kite stations; six operated by the Weather Bureau and the rest by the military.